Alabama is one of those hidden gem states, where you wouldn’t expect there to be as much awesome nature as there is. But did you know that Alabama is home to dozens of waterfalls and over 4,200 caves?! We traveled through northern Alabama in July and spent a long weekend exploring Alabama’s waterfalls and caves. DoSoto Falls stands 104 feet tall on the Little River in northeast Alabama. This unique waterfall is interesting because there is dam behind it, creating a cascading backdrop that plunges down toward a smaller set of falls, before descending the final massive drop to the lake below. DeSoto Falls is located near Mentone, in northeast Alabama. From AL-117, turn off on County Road 613, which will lead you to the falls. The hike down to the falls was shaded and easy, although some scrambling over slippery boulders was necessary. The hike starts by wading across the water below the dam to the opposite side, and climbing up the rock wall on the other side. From that point on it is pretty well marked. If you stray off, just keep descending down and to the right. You end up at the lake below the waterfall. There is a nice rocky beach we stayed on and swam from. Who knew Alabama had all these waterfalls?! We sure didn’t! It’s true what they say, every state and country has its own beauty. What was a place that surprised you with it’s beauty? Hiking isn’t the only activity to do in DeSoto State Park. There is a shallow pool above the falls perfect for swimming and playing with kids in. There are also kayak and canoe rentals that can be used on the section of the river above the dam. Fishing is welcome in the river, as well. We recommend fly fishing for the best catch, but fishing with spinning rod and bait casters is also possible here. 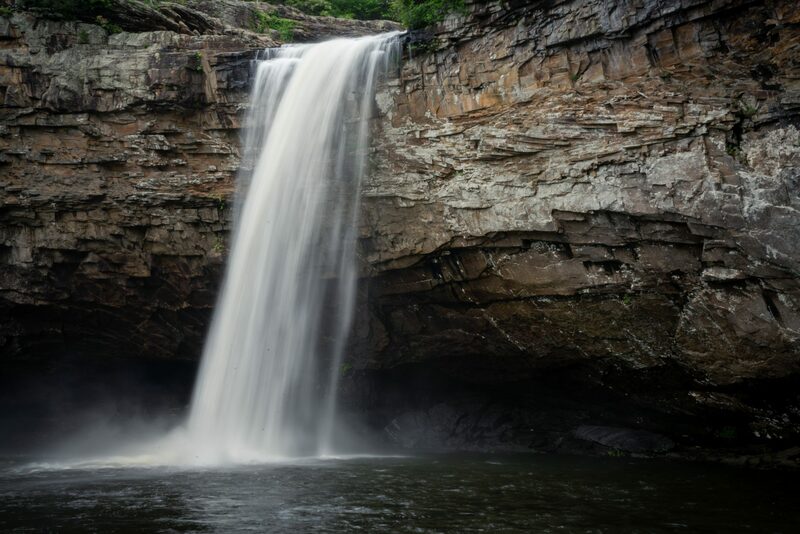 Located on Little River, the same river as DeSoto Falls, lies Little River Canyon Falls. These beautiful falls are located right off of Highway 35, and make the perfect pitstop for those passing by. Little River Canyon Falls is located right off AL-35 South near Fort Payne, AL. There isn’t a hike, just a boardwalk that leads you a few yards to a lookout of the falls. We were driving by on our way back to Florida and decided to stop by for a quick pitstop. If you have more time in the area, we recommend exploring the various backcountry hikes within the Little River Canyon Preserve. This gigantic cave holds 6 world records: for the widest cave entrance in the world, tallest cave room, largest stalagmite (Goliath, pictured below), largest flowstone wall, largest “frozen” waterfall, and largest stalagmite forest of any cave in the world! Fun Fact: This incredibly massive cavern was once a designated bomb shelter back in the 60’s. Walking through the cathedral room (below) felt like walking through Mother Nature’s underground castle. It was certainly something else. Cathedral Caverns is located about 30 minutes outside of Huntsville. From Hwy 72 East, turn right onto Cathedral Caverns Highway (County Rd 63). After about 6 miles, turn right onto Cave Rd, at the state park entrance. From Hwy 72 West, turn left onto Cathedral Caverns Rd. Continue for 2.4 miles and make a left onto Cave Rd. Walking through Cathedral Caverns is an amazing experience perfect for novice cavers. It can be done with the whole family, and is a guided tour on a mostly flat walkway. Those in wheelchairs or unable to walk can take a driving tour through on a golf cart with a guide. Ticket prices are $18.50 for adults, and $8 for children 5-12. Children under 5 tour free. You are also able to camp here for $13 for the primitive sites, or $20 for improved sites with electric hookups. Although we prefer backcountry hikes to commercialized, guided tours, we really enjoyed the experience. Our guide was excellent and really made the history behind the cave come to life. We highly recommend adding this tour to your bucket list! By far our favorite cave, Stephen’s Gap is best visited around noon on a sunny day to witness the incredible light rays that beam through the gap during this time. A waterfall runs through the cave, creating a mist that, during midday, provides the optimal environment for light to reflect off the suspended water droplets, creating incredible, dramatic beams of light. This secluded, hidden gem requires a (free) permit to hike to, and only allows 15 groups to visit per day. Experienced climbers can rappel through the gap to the pedestal below. For those who prefer to stay on the ground, a side entrance exists that allows you to scramble down rocks into the cave. Make sure to bring a headlamp or flashlight!! Stephen’s Gap is located in Woodville, just a short drive from Cathedral Caverns, making it very accessible for those camping at the state park. From US 72 (Lee Highway), take AL 35 towards Woodville. Four and a half miles past Woodville, look for a short, paved cutover across railroad tracks leading to Jackson County Road 30. Turn left of County Road 30. Drive about 50 yards and a small parking area will be on the right side of the road. The hike itself is only 2 miles round trip along a narrow, wooded trail. We ended up going on a wet rainy day, which made this hike go from easy to moderate. The rain made the trail extremely muddy and slippery and therefor took us twice as long to hike. Although obvious in the beginning, we got a little lost towards the end. There are lots of side trails, and not many yellow trail markers on the trees to keep you on the right track. We ended up finding it though (just look for the big, gaping hole in the side of the rocks). DeSoto Caverns is located near Birmingham, Alabama. The cave is open year round, and has over 20 attractions such as the Desoto lost trail maze, wacky water golf, the foam falls for kids, and of course exploring the wonderful caverns. To read more about the attractions DeSoto Caverns has to offer, click here. Feeling hungry? Desoto Caverns now offers the Cave Café, where they have partnered up with local quality companies to make your visit at the park more enjoyable. Do you blog and do photography like us? Well, they have a great indoor seating with free wifi for that. Don’t forget to try there homemade cookies and hand pies! This is the perfect cavern to take the kids for an all day outing. DeSoto Caverns is on the pricier end, however. Tickets start at $29.99 per person for 1 cavern tour and 2 attraction passes. Falling in love with your visit at DeSoto Caverns? Well, you don’t have to leave just yet! They have primitive and RV campsites available. Sites include free wireless, full hookups, and are located near bathrooms, showers, washer and dryers. Prices start at $21.99 a night to pitch your tent, and $29.99 a night for a 30 amp hookup and $34.99 for 50 amp hookup. Noccalula Falls is located 45 minutes form Little River Canyon Falls, just outside of Gadsen, Alabama, off of AL-211. The best view of the falls is from down below, where you can walk behind the waterfall for a unique perspective. Admission is $6 per person and includes access to a petting zoo, beautiful botanical gardens that just opened up in 2018, as well as a train ride around the park. The train ride is a great thing to do right when you get in the park and gives you more of an idea of where everything is located before adventuring off on foot. Want to take the kids for some mini golf? A course is located in the park starting at $5 for adults, and $4 for children. Key note, the mini golf course is shut down during Winter from October 31- March 1st. Fell in love at Noccalula Falls? You can now get married there, call the campground office at (256) 543-7412 to book your wedding. Camping is available within the park with over a 120 sites to choose from. Pitch your tent at one of the primitive sites, or bring your RV to one of the pull-through sites with complete hook ups. It will run you $19.42 per night to pitch your tent here, and about $25.02 per night to hook your RV up. Choose to stay up to 7 nights here, with the 7th night being free! Check-in for RV’s is at 1 pm. Would you prefer to stay in a cabin? Well, if so you better get on it quick. They are limited to only 2 cabins on site, each with 2 bedrooms (each with a queen size bed), 1 bathroom, and a futon in the living room, making it an easy stay for up to 6 people. Here, the Black Creek trails are only a few footsteps from your front door! Cabins start from $110 night. What’s a state that has surprised you with its beauty? Have you ever been to Alabama before, or have you ever been caving? Tell us in the comments section below! Like this post? Don’t forget to share it on Pinterest!